Posted by Jim Stanford under employment, labour market, unemployment. The federal government never tires of boasting that Canada’s labour market has performed better than most other countries through the financial crisis and subsequent recession, and that the number of Canadians working today is greater than it was before the recession hit.Â That means we have fully recovered from the downturn, and the Tories are good economic managers, right?Â Wrong. This trick is based on ignoring the fact that Canada’s population is growing, and relatively rapidly.Â Our working age population has grown by 1.75 million since 2008 (or just under 1.5% per year).Â So it’s hardly an accomplishment to get back to the same total absolute number of jobs (or even higher), when there are 1.75 million more Canadians capable of working. The best way to measure jobs performance over time, relative to population growth, isÂ by analyzingÂ the employment rate.Â (It’s better than the unemployment rate, which is distorted by the problem of falling labour force participation, which in turn reflects large numbers of Canadians who’ve given up looking for work. )Â Canada’s pre-recession peak employment rate was 63.8 percent (attained early in 2008).Â It plunged quickly and frighteningly, to 61.3 percent by June 2009 — a decline of 2.5 points.Â Then it recovered, for a while — reaching 61.9% by January 2011.Â With a few bumps along the road, that’s exactly where it sits today.Â The employment rate for June was 61.9 percent.Â The labour market has recovered less than one-quarter (0.6 points out of a total decline of 2.5 points) of the damage that was done by the recession.Â More damningly, progress has stalled completely for the last two-and-a-half years — when governments (including ours) forgot about stimulus, and turned to austerity. International comparisons are also skewed by this phony reasoning.Â Countries like Germany or Japan, with relatively stagnant populations, don’t need to create net new jobs in order to retain good labour market health.Â Canada does.Â So showing that Canada’s absolute job-creation rate is stronger than countries with low or even negative population growth, is a chump’s achievement. The OECD Employment Outlook released earlier this week had some surprisingly critical words to say about Canada’s notoriously weak employment protections (which it ranks as among the most employer-friendly in the world).Â Dig into its statistical tables, and you will also find some damning statistical data.Â Their table on the evolution of the employment rate in 34 OECD member countries puts paid to the Tory claim about our relatively strong jobs performance.Â When I last reviewed this data (for a CCPA report published in early 2012) we ranked right at the mid-point.Â After another year of labour market non-recovery we’ve fallenÂ well into the lower half of the list.Â Ranked by change in employment rate between 2008 (when the recession hit) and 2012, Canada ranks 20th out of 34.Â I have organized the chart by ranking; the original OECD data is available here. 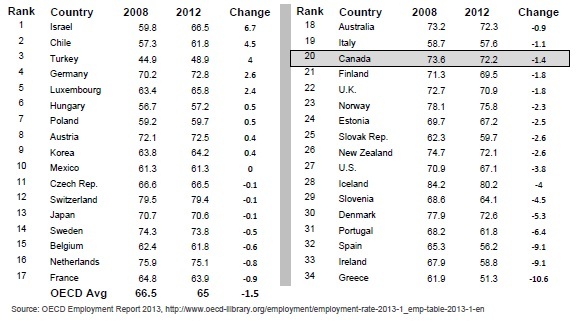 Nine countries have increased their employment rate since 2008 (including Germany, Korea, and Austria).Â These countries can claim to have fully recovered from the recession (at least by this central measure of labour market well-being).Â Canada, however, clearly cannot.Â We’ve done better than the U.S., and much better than countries hit by economic catastrophe (largely the result of misplaced austerity), such as Greece or Ireland.Â But we now rank squarely in the lower half of OECD countries according to job-creation (relative to population growth). It is simply false to assert that Canada’s labour market has recovered from the recession, or that Canada’s labour marketÂ has done better than most other countries in suriving the recession.Â No matter how often this claim is uttered by government officials and reported uncritically by lazy journalists, it’s still simply false. I think you mean “stagnant populations” or something there, yes? This is really depressing. It’s depressing for me because I’m an unemployed economist. I get the reality of what you’re saying blaring at me in the labor market as I try to live with dignity. And it’s depressing because there’s nothing here that you’re saying which is positive. Unemployed people need a thread of hope along with the sad reality that you are sharing. Something along the lines of how people who have been unemployed are more compassionate coworkers once they’re employed…and therefore beneficial to hiring managers. Please communicate something to help lift the stigmatism surrounding unemployed people. It’s a curse and it’s self fulfilling. thanks. love your work otherwise. Thanks for the catch, Purple Library Guy! That was a brain fart on my part! Jim the flip side of job creation, or lack there of, is the unemployment rate and as we know there is the “official rate” and the real numbers of people who can’t find work. We need to find a way to report that “real” number to the public. As Anon says it is depressing and those without work need to know they are not alone!